What surprised me is the stability of the figures over time; in 12 of the 18 elections, the campaigns spent between $2 and $5 per vote cast, in 2011 dollars. That includes most of the elections before the early-70s reforms, suggesting that, contra Jon's point, the reforms did not force campaign spending to artificially low levels. 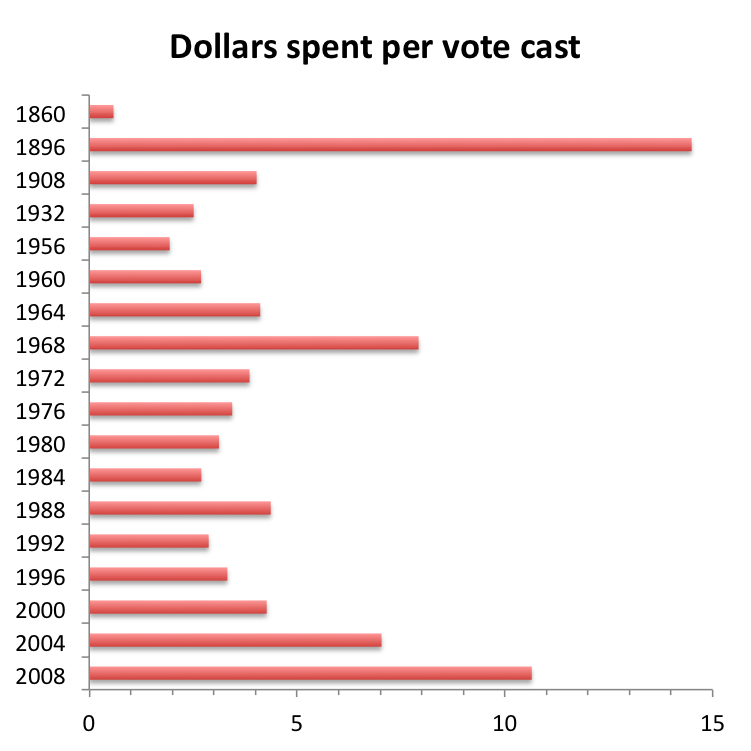 2004 did see an unusually high level of spending, but not quite as much as was spent in 1968. 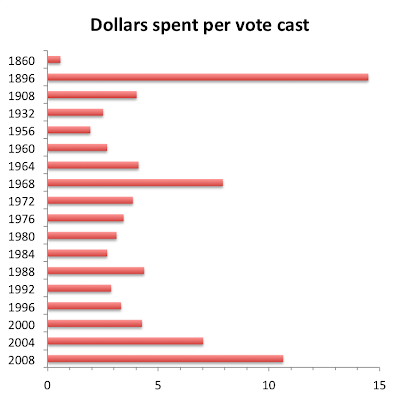 And 2008 really did see a lot of spending, although 1896 still holds the record. Like Jon, I don't see any particular problem with increased levels of campaign spending. Most of that spending consists of voluntary donations by wealthy Americans financing ads that inform middle-class Americans about presidential candidates. I fail to see the harm to the Republic. *Jon suggests that it might be better to measure money spent per eligible voter, rather than per vote cast, since it is the eligible voters that the campaigns are trying to reach. I agree, but figuring out the eligible electorate in many of these years is a tad tricky. Millions of Americans were legally eligible to vote from the 1870s to the 1960s but nonetheless faced taunts, beatings, or death for trying to do so. Update: See here to see campaign spending as a function of real GDP. Very cool chart. One thought: between the 1896 election and 1908 election the Tillman Act was passed to prohibit corporations from contributing to campaigns. Mark Hanna was famous for raising large amounts of money from them. The graph suggests the law may actually have been fairly effective in restraining spending. Good point, Peter! It's hard to know from these data, though, whether 1896 was unusual for the era or whether spending sharply dropped right after it. Interesting, but I think the measure is largely meaningless, because it doesn't capture non-campaign expenditures (e.g. op-eds, ideologically-driven news stories, or talk radio) which presumably would vastly exceed other expenditures on political speech. Eligible voters is the way to go because turnout varies. We're a lot richer than 100 years ago. An inflation-adjusted dollar bought a lot more labor back then. I prefer percent of GDP, as on page 55 of this pdf. 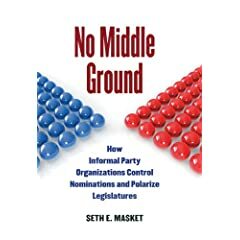 This addresses the increasing population, though not the increasing voter turnout. Inflation adjusting is a terrible way to measure campaign expenditures — it totally ignores growth of national wealth and income, which matter *a lot*, Mr Knight is right about that. Expenditures per voter is somewhat better, as it partially adjusts for growth -- but it too fails to reflect the increase in income and wealth. As the nation becomes richer, people can both (1) more easily afford to spend more money on elections, just as they can spend more on everything else, and (2) gain more from doing so, as there is more for the government to direct in their favor, if they can get it to do so. On its face this would suggest that campaign spending would be expected to increase steadily as a portion of national income. Yet when adjusting the numbers for GDP, it is remarkable that this *hasn’t* been so. The expected trend of an increasing portion of income being spent on elections is totally lacking. Which brings to mind a question many political scientists ask -- with such a *vast* amount at stake in a $15 trillion economy, why is so *little* spent on electioneering ... with that amount not even growing in terms of real income? Cool numbers, Jim. Am I correct that the second appearance of 1896 is actually 1996? I would like to use your graphic here in a round up where I quote your analysis and link to your post. May I? Let me know at eschulzke [at] desnews [dot] com. Thanks! هل تعلم أن مكافحة الحشرات اصبح امراّ مهما للحفاظ على اسرتك ؟ قولوا #لا_للحشرات مع شركة الامل كلين اصبح حماية منزلك واطفالك من الحشرات وامرضها امراّ بسيط لمعرفة المزيد عن خدمتنا . وتتميز بالايدي العاملة الماهرة وتتميز بخامتها المميزة ،نحن لدينا خبرة كبيرة في انشاء وتصميم المظلات والسواتر ،كما ان اسعارنا لامثيل لها ولا نقبل لاي منافسة وتكون مناسبة للجميع كما اننا نقدم عروض وخصومات هائلة للمساحات للكبيرة، تواصلوا معنا الان لكي تتمكنوا من الحصول على افضل خدمة من قبل القاضي ،نحن نعمل على مدار ال24 ساعة ونكون سعداء ان نستقبل جميع الاتصالات في اي وقت ، لا تبحثوا كثيرا فالقاضي اسم موثوق به ومعروف عنه المصداقية والامانة في العمل ،فالقاضي مميزة بسمعتها الطيبة وخدماتها الرائعة ،اتصل الان وسوف ناتي اليك علي الفور . شركة المنزل هى شركة مكافحة حشرات بجدة لدينا العمالة المدربة التى تقوم بالقضاء على حشرات جدة كالصراصير بجدة والقوارض بجدة والعته بجدة وبق الفراش بجدة والوزغ بجدة ونحن نستخدم اجود انواع المبيدات المستوردة التى تقضى على الحشرات الطائرة والزاحفة بجدة وجميع خدماتنا نقدمها بأسعار رخيصة فى متناول الجميع .